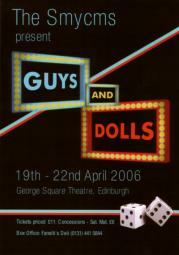 The Smycms show for 2006 was the much loved ‘Guys and Dolls’ , based on Damon Runyon’s short story The Idyll of Miss Sarah Brown, it features the music and lyrics of Frank Loesser with Abe Burrows and Jo Swerling providing the book. The slickest big-time New York City gamblers, Sky Masterson and Nathon Detroit, can’t resist making or taking a bet on anything. So when a pretty missionary sets up shop in the neighbourhood. Nathan stakes a grand that Sky can’t seduce her. But all bets are off when Sky falls madly in love in this romantic musical spectacular that sets the Big Apple afire with excitement!. Featuring hits like ‘Luck Be A Lady’ and ‘A Woman In Love’ this classic show-stopper hits a fever pitch, recalling a winsome era of gentlemen gangsters and their ladies in an unbelievable, unforgettable lavish musical loaded with laughs. For this production Smycms had to find an alternative venue from their usual home at the Church Hill Theatre, Edinburgh. The theatre was closed for renovation including the installation of disabled access to the auditorium, a much needed upgrade. After much deliberation we acquired the use of the George Square Theatre, although more usually used for lectures for the University of Edinburgh, it none the less proved a very suitable venue for our production of Guys and Dolls. Artistic Director: Laura Jordan Reed, Musical Director: Alison Rushworth, Choreographer: Janice Bruce. I have become great fan of yours blogs&articles. I really want to become like you, I hope I could but you are really great let me know something more about this.ok thanks.